Raw Devices are disk partitions or logical volumes that have not been formatted with file system. When you use raw devices for database file storage, Oracle writes data directly to the partition or volume, bypassing the operating system file layer. For this reason, you can sometimes achieve performance gains by using raw devices. However, because raw devices can be difficult to create and administer, and because the performance gains over the modern are minimal, Oracle recommends that you choose Automatic Storage Management (ASM) or file system storage in preference to raw devices. Updating .bash_profile file. for oracle. we need to stamp the raw disk or partition (In our example /dev/sda3) to be recognised as Volume Group disk. We execute the pvcreate command as root to stamp the disk. 128 logical and 128 physical partitions with the extent size of 512 KB. Under this Volume Group (oracle_vg), we will create logical volumes one for each tablespaces, redolog files and control files. the following number of logical volumes of mentioned size for each objects. Execute the below command as root to create n number of logical volumes by executing the same command n number of times. logical_grp_name represents the group name where this volume is created. I have run this command 14 times to create 14 volumes for our test database files. Run lvscan as root to get the information on volumes. created in the above steps. 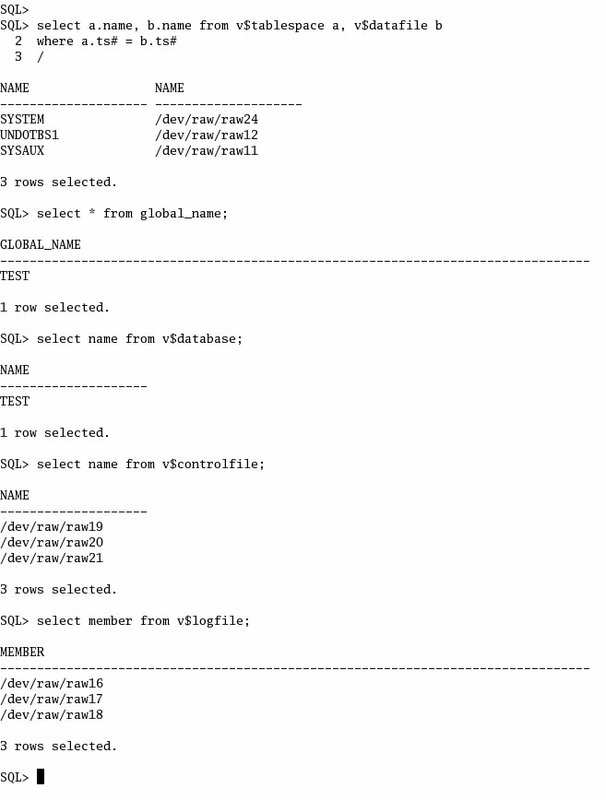 Create a database file subdirectory under the Oracle base directory and set the appropriate owner, group and permissions on it. create the data using that. Manual method of creating database does not require this file. Optionally, You can create the softlink to the raw devices (e.g /dev/raw/raw10) to make this file recognize easily. below steps to create the softlink and use them instead of device name. Now create the test_raw.conf file under $ORACLE_BASE/oradata/test directory and add the below lines in it. if you create the database through dbca. Once you complete the former steps (except creating config file and creating links), you are ready to create database manually. directory and add the below lines into this file. Now ruu the $ORACLE_HOME/rdbms/admin/catalog.sql and $ORACLE_HOME/rdbms/admin/catproc.sql. Please follw these steps to crete the database using dbca that uses raw devices as storage options.